Revere Offshore Commander Liferaft; the one we purchased. Emergency liferafts are painful maritime safety investments to purchase. You buy them and at the same time pray you will never ever need them. Add to that category boat towing service, EPIRBs, flares, flare guns, and whistles, DAN (Diver’s Assist Network) and boat insurance, when we’re required to carry it. In all honesty, we should’ve purchased a liferaft earlier. We were less compelled as our past travels kept us always within a day sail of land, in areas well-populated with other boaters. Admittedly our delay was also due in part because for us it’s far less painful to pay “boat bucks” (measured in increments of $1,000 or more a pop) for something expensive, like a dinghy (our West Marine 10 ½ foot hypalon inflatable boat with a zippy fiberglass bottom) that we us regularly as our “car” from our boat, to land when at anchor or mooring ball). And while we’re notoriously frugal (some might say cheap) our oversized, non-dragging, rock-solid Rocna anchor wasn’t cheap, either, but it’s worth every penny to sleep well at night. The list goes on (and on and on). In any case, the purchase for a LOT of those delayed our purchase of a life raft. I’m not proud of it, but there it is. of open ocean (nothing in between). In case of our Revere Offshore Commander Liferaft, we were fortunate enough to get a West Marine Pro Deal as a West Marine employee (again – thank you West Marine for significantly lowering my price on a product that normally retails for over $2899 + 7% sales tax) from the nice folks at Jacksonville Florida-based Revere Survival Products. We emptied our wallet and opened our lazarette to safely stow the 67-pound raft. We could’ve shaved 14 lbs off the weight the Offshore Elite, which came with other nice bells and whistles, but didn’t fit our already busted budget. I made sure I can lug it out myself, if need be. The liferaft will only be deployed if we abandon ship. 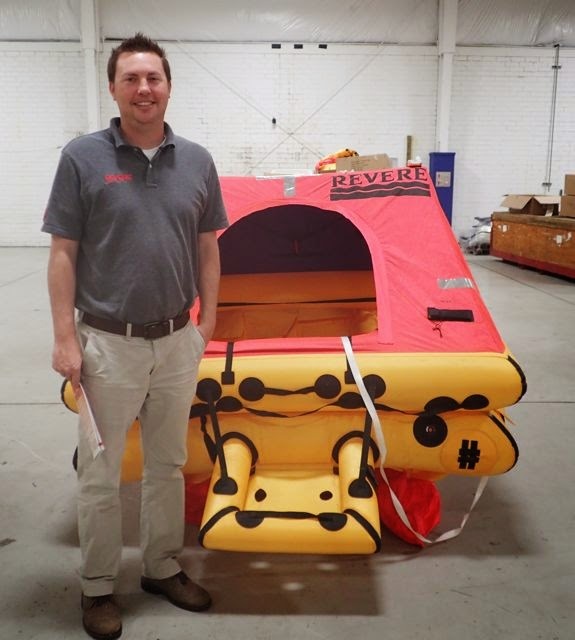 If that catastrophe happens, we’ll have some comfort knowing we bought the correct offshore raft, the roomier 4-man Revere Offshore Commander, to meet our needs. It’s covered to protect us from wind, rain and sun, chock full of rations (to be supplemented by our pre-packed ditch back and our laminated checklist of other items to grab at the last minute). than ours with an easier to use inflatable ladder. For those of you who care about your cruising safety, don’t wait to the last minute if you want one! Generally liferafts can only be ground shipped. 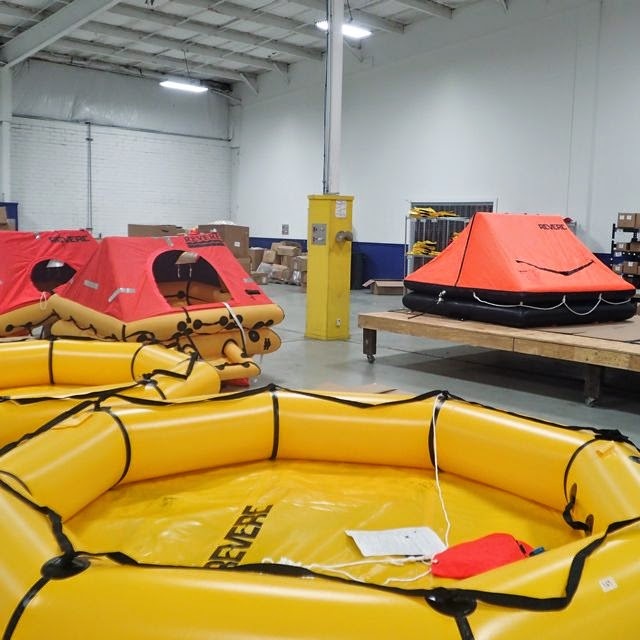 Despite working at a 40,000 square feet flagship West Marine with ample stock, even at our store, liferafts are normally special orders rather than on-shelf stock. Regrettably, when I worked at West Marine Jacksonville Town Center there were a few times cruisers leaving that or the next day came in to buy a life raft. I turned them away, not knowing that there was a local manufacturer a phone call away! Rich, if you’re reading this post, my apologies to you and Revere for a lost sale or two and please spread the word to Jacksonville’s West Marine employees! Thank you Trey Hawkins on West Marine's New Brunswick store for tipping me off to Revere in Jacksonville. Thanks as well, Kini, for the Revere Survival Products factory tour, even though you were getting settled after moving to your new digs just one week prior. 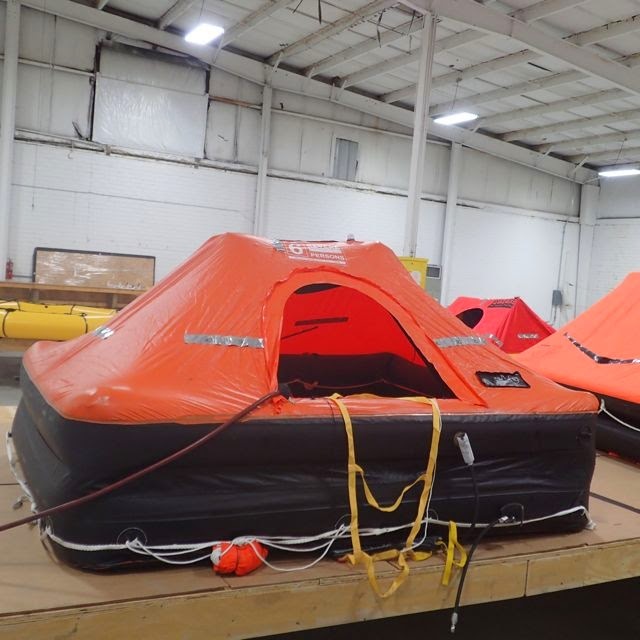 We appreciate your taking the time to advise us on understanding the tradeoffs to select what we believe is the right liferaft for our offshore cruising needs. Most of all, we thank you and Revere for a well-made liferaft we hope and pray we never, ever need to use. we'll sail across in the South Pacific from Galapagos to the Marquesas. It's what inspired us to invest in a liferaft we hope to never use. Our boat's in Manatee Pocket (N26.59.098 W78.12.951), Stuart Florida. It’s a good take-out point and rent a car to make one last visit to Mom, in DelRay Beach Florida, and Dad, in Sarasota Florida) before leaving the country for 2 years, headed to, through and across the South Pacific for Australia.